(2) BOSE 191 Virtually Invisible Speakers, Rectangle In-Wall/Ceiling. We WILL work with you if there is on fact a problem with your order and are not satisfied. We will work with you as best as possible. Theater Solutions TSCST87 In Wall and In Ceiling 9 Speaker Set. 2 Pieces of TS1000 In Wall Passive Subwoofer Speakers. 2 Pieces of CS8C Round 8" In Ceiling Speakers. 1 Piece of TSLCR5 In Wall Center Channel Speaker. JBL SS8 Two Way " IN Wall Speakers (Pair). 1" Pure Titanium Tweeter. These are up-grade 3 way SPEAKERS (pair) with great sound quality. Mid-range and tweeters swivel. 120 watt max power, 55hz-28000hz. Low cost, high quality ceiling speakers provide excellent sound in any whole house audio system, and are ideal for use in an insulated ceiling. 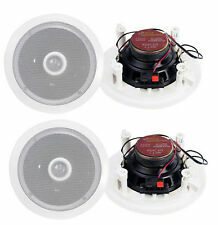 6 1/2" Enclosed Ceiling Speaker Pair. Poly-cone woofer with rubber surround. 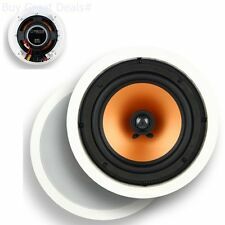 Emphasys IW 65- Speakercraft 6 1/2" In Wall /Ceiling Speakers - Pair. Condition is Used. This is a current model quality in-wall speaker from Sonance. This is a better deal! The size if 6 7/8 X 13 3/8 X 3 1/2. Fit is a cutout of 6 wide and 12 1/2 high. You can fine tune the blend of sound using the built-in high frequency attenuator in case the sound is too bright. This carbon fiber in-wall speaker is the perfect combination of performance and style. SET OF 3 Sonance Moderno MLCR in=wall speakers - NEW. Condition is New. The MLCR performs equally well horizontally, as the center channel, and vertically as the left and right channels. 4.5 out of 5 stars - Nice Pair Of Bose Virtually Invisible 191 In-Wall Speakers With Square Grills. 10 product ratings10 product ratings - Nice Pair Of Bose Virtually Invisible 191 In-Wall Speakers With Square Grills. Purchased these for a remodel but last minute changed from in wall to in ceiling placement is need to get ceiling speakers instead. New in original, unopened packaging. Will provide original receipt on request to buyer for warranty purposes. The dual speaker pair feature long-throw woofers that can be used for virtually any in-wall or in-ceiling application. They are perfect for custom installations since they mount flush for a clean and professional look. Theater Solutions CS5W Contractor Series In Wall Speaker Pair. Indoor and Outdoor Speakers. Their easy in-wall installation and ultra wide sound dispersion design make them ideal for discreet, single or multi-room installations. In addition, the JBL SP6II can be painted to match any decor. Trending at $87.47eBay determines this price through a machine learned model of the product's sale prices within the last 90 days. 4.5 out of 5 stars - Bose Virtually Invisible 191 In-Wall Speakers Pair With Square Grills. 10 product ratings10 product ratings - Bose Virtually Invisible 191 In-Wall Speakers Pair With Square Grills. Theater Solutions CS8W Contractor Series 8" In Wall Speaker Pair. Indoor and Outdoor Speakers. Their easy in-wall installation and ultra wide sound dispersion design make them ideal for discreet, single or multi-room installations. New, in box. Bohlender Graebner, aka BG Radia was the world leader in planar ribbon loudspeakers. The RT Series was their highly affordable custom speakers to accommodate every budget and still uses the Neo3 planar mid-high driver found in the much higher cost PD series! 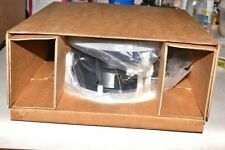 Polk audio RC80i 2 way in ceiling/in wall speakers, pair- white, new in box. 5 out of 5 stars - Polk audio RC80i 2 way in ceiling/in wall speakers, pair- white, new in box. 19 product ratings19 product ratings - Polk audio RC80i 2 way in ceiling/in wall speakers, pair- white, new in box. Trending at $149.84eBay determines this price through a machine learned model of the product's sale prices within the last 90 days. For sale is one Pair of SpeakerCraft model AIM WIDE ONE in-wall speakers. WHAT INCLUDES : One Pair only. 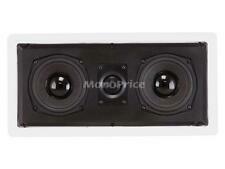 Sonance 832R In-Ceiling Speaker Pair. They are new and in the original box. Shipped with UPS Ground. Up for sale is one pair of Yamaha NS-IW660 6-1/2" In-Wall Speakers ( Pair ). New in the box pair of Niles MP5R speakers for in Wall. In-Wall LCR Speaker. The In-Wall LCR Speaker has dual 5.25" aluminum woofers with a 1" titanium movable tweeter and 12db crossover. It can be installed horizontally or vertically. It is also excellent for use as an in-wall center channel or for left and right applications where more bass response is required. Integrated dog-legs brackets make installation fast and easy for retrofit applications. Woofer Type: Kevlar Woven Cone. Woofer Size: 8". Tweeter Size: 1". Woofer Quantity: 1. Tweeter Quantity: 1. Tweeter Pivoting: Yes. Monoprice brings custom in-wall speakers to new levels of affordability with our line of Monoprice Brand Premium in-wall and in-ceiling speakers. These high fidelity units deliver the high quality craftsmanship and construction you've come to expect from Monoprice brand products at a fraction of what you would expect to pay for them retail.In-wall and in-ceiling speakers allow you to expand your listening environment throughout your entire home as well as remove the clutter of giant box speakers giving you back your living space. In either case it's a win-win situation for those who desire high fidelity and those who put emphasis on decor.Kevlar cones are light weight yet extremely rigid, providing very precise audio reproduction with minimal distortion normally caused by cone flex. Our. Pair Of In Wall 2way Speakers. I had these in my bedroom for many years and were rarely used. They are painted to match my room but can easily be repainted to Match your decor. Great sounding speakers. There are various concealed screw hole fastening points. In-wall speakers can be a great way to add more sound to your current audio setup in a convenient and unobtrusive way. These kinds of speakers come in a variety of configurations, shapes, and brands. You can browse through the selection on eBay to find the in-wall speakers for your home theater or business. Wired - These in-wall mounted speakers use standard wires that run from their housing to the sound system of your choice. Wired wall speakers can use several types of connectors to interface with your audio devices. Wireless - You may wish to connect your speakers to your sound system without using wires. In-wall speakers with Bluetooth connectivity can talk to your audio system wirelessly. The wall speakers and the sound system can recognize each other on the same network. The configuration of your in-wall speakers can determine how many speakers you get in a set and how they function. You can get a single in-wall speaker or a set that includes dual speakers. Some combinations will include a subwoofer. 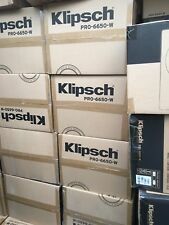 How can you buy used in-wall speakers? Standard - A standard used speaker system should be in good working order. However, it may feature some noticeable cosmetic defects from normal use. Refurbished - These pre-owned in-wall speakers are not sold as new, but they have been restored to look and perform like their new counterparts in most cases. Parts - Some used in-wall mounted speakers might be available for use as backup parts. Can you choose different shapes? Wall speakers come in a variety of shapes and sizes to fit the layout of your home theater system or your personal preferences. If you like a particular shape or want to find one that works with your system, you can use the menu options on eBay to narrow your search. Common shapes for these items include circles, spheres, and rectangles.